The start of this epic journey is one of my favourite British cities, Inverness, which is large enough to matter but small enough to enjoy. The station, located in the city centre, is a terminus and all trains initially leave in the same direction irrespective of their destination. However our train turns sharp left before really leaving the station, crosses the River Inver, heads through the suburbs, crosses the Caledonian Canal on a swing bridge and the follows the shores of Beauly Firth - and that is in the first ten minutes of this 161 mile journey (175 if you count the trip down to Thurso and back). Putting this in context the journey is London to a few miles past Crewe! Photo - Arrival at Wick station the most northerly point on Britain's railways. A 'right time' departure from Inverness at 1038 in a half full train on a bright sunny day was unexpected. The lack of passengers was the biggest surprise with only a handful along for the ride. Enjoying the loch side view I settled into my seat knowing that arrival in Wick would not be for another 4 hours or do. Across the loch was Ben Wyvis, the summit covered in cloud. Stops at Beauly, Muir of Ord with sections of clickety-clack on jointed rails took us to Dingwall (1107). The station here is mostly intact soon after departure the line to Kyle of Lochalsh bears left. The railway does not benefit from bridges across the lochs and takes the long way round to run alongside Cromarty Firth to Invergordon (1125). Anchored in the Firth were a number of oil rigs and drilling platforms from the North Sea oil operations awaiting repair. Leaving Invergordon with its nice mural on the walls and a whisky distillery, the arrival of the catering trolley was a welcome diversion. Gabriel from Hungary was doing the serving and admitted he was a long way from home both in distance and culture. It is worthy of comment to complement Scotrail for the clean windows on the train as it helped passengers enjoy the superb views that were constantly changing. Arrival at Tain (1145) and another stretch of water - the Dornoch Firth is beside the line. Continuing past Carbisdale Castle (now a youth hostel) the railway starts to climb through silver birch and rocky outcrops to Lairg (1217) where a post bus was waiting. Just after leaving the station the line crosses the summit at 488 feet above sea level from where a gradual descent follows down to the sea at Golspie (1245). The seashore is followed closely to Helmsdale (1310) where the route heads inland. This is spectacular country as the line threads its way up the Strath of Kildonan with signs of habitation decreasing as the coast is left further behind. Wild moors with snow fences along the line suggest that winters might be harsh. Small stations are passed without stopping - Kildonan and Kinbrace both listed in the timetable as request stops. Not even a sheep in sight! Forsinard (1344) and we wait to cross a train from Wick the second such meet of the journey. Still climbing we pass the summit sign (708 feet above sea level), speed through Scotscalder and into civilisation once more at Georgemas Junction (arrive 1407). The train reverses here and disappears down the branch to Thurso and back to finally leave the junction for the last time at 1437. 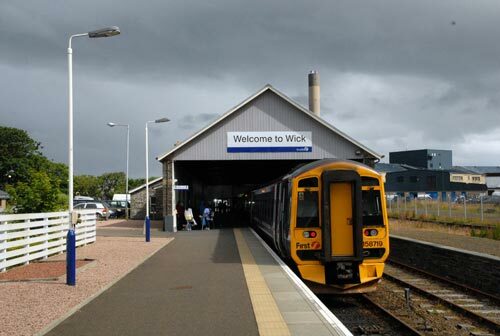 Less than 20 minutes later we arrive at Wick the most northerly outpost of railways in the UK. With just over an hour to explore the town before the departure of the return to Inverness at 1600 I soon realised that there was little of note to see in Wick. True it's a working town in what must be an isolated location but sadly it lacked charm. Back at the station I settled into my seat. We left on time ran down to Thurso via Georgemas Junction. A reversal at Thurso, back to Georgemeas Junction where we departed for a final time at 1643 over two and a half hours after our first arrival. The journey back was just as pleasant and we passed more trains than on the outward journey. Arrival in Inverness was on time at 2007 in time to catch the Caledonian sleeper down to London!